We’d love your help. Let us know what’s wrong with this preview of Realm Quest by Tom Huddleston. Raised as a slave in the Darkoath camps of Aqshy, Kiri dreams of a better life. Of a city of wonders, the place of her birth… Lifestone! She despairs of ever reaching it until a fateful day arrives when her barbarian captors are attacked by Sigmar's noblest warriors, the Sto Epic heroes, mighty armies and terrifying monsters clash against the backdrop of magical landscapes. To ask other readers questions about Realm Quest, please sign up. I work at a library and received this book as an ARC. My husband is an avid Warhammer player, so I let him read this. This is his review. I might pick it up to read it, but I don't have the attachment to the game like he does. And honestly, I probably wouldn't get most of the references. When Games Workshop announced they would be doing a couple of children's book series based on their popular Warhammer franchises, I was fairly skeptical. Warhammer Age of Sigmar and W I work at a library and received this book as an ARC. My husband is an avid Warhammer player, so I let him read this. This is his review. I might pick it up to read it, but I don't have the attachment to the game like he does. And honestly, I probably wouldn't get most of the references. When Games Workshop announced they would be doing a couple of children's book series based on their popular Warhammer franchises, I was fairly skeptical. Warhammer Age of Sigmar and Warhammer 40,000 are both game universes with extremely loyal and fanatic fans, and lore that spans decades of constant additions and development. Though the material in them seem goofy at certain angles, they still manage to live up to the most common descriptor of "grim-dark." The lead tagline for one of them is, "In the grim darkness of the forty first millennium, there is only war." So it was no surprise that there were mixed reactions from fans at the idea of these getting reinterpreted for a younger audience when violence, war, death, and many other adult themes are the norm in them. There were also questions on whether or not it is necessary, as many fans believe children should not be shielded from harsh themes of these fictional settings. I remember being enamored by all the intricacies of Warhammer 40,000 at a very young age myself, grim-darkness and all. 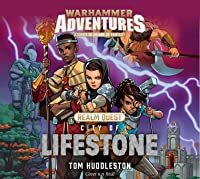 This book, "City of Lifestone," is the first in the fantasy Age of Sigmar setting and after having read it, I am a little more optimistic for the future of this series. It conveys the setting of the Mortal Realms well without needing to explain the expansive history and other realms. As for the story itself, it is a basic destiny adventure story with memorable characters and exciting scenes. Admittedly there is not much to take away for adult readers who follow a lot of the book series, but the core and feel of the universe is there. My biggest criticism, however, are some needless omissions of aspects of gods and divinity. The God-king Sigmar, the celestial god that leads up the war against Chaos, is just referred to as King Sigmar. Also with Chaos, I found it was more referred to as "the forces of evil," which is a little cheesy. The Chaos gods are one of the most iconic aspects of the Warhammer settings, so dancing around them like this is not very reassuring. However I did see them referred to as Chaos with a capital 'C' once in the whole book, but it is not known whether this is intentional or just was missed by proofreaders in this advanced reading copy. I thought I would give this book a try because what could a children's book set in the bloody grimdark Warhammer universe possibly be like? It ends up it's pretty much like every other children's fantasy novel. It's not necessarily a bad book by any means, it just doesn't feel like Warhammer; and I'm not sure it ever could. The only thing "Warhammer" are some of the creatures and the mention of the different Warhammer Realms, Realmgates, etc... but those could have been easily substituted with a I thought I would give this book a try because what could a children's book set in the bloody grimdark Warhammer universe possibly be like? It ends up it's pretty much like every other children's fantasy novel. It's not necessarily a bad book by any means, it just doesn't feel like Warhammer; and I'm not sure it ever could. The only thing "Warhammer" are some of the creatures and the mention of the different Warhammer Realms, Realmgates, etc... but those could have been easily substituted with anything else and the story still would have worked. The difficulty in judging both Warhammer Adventures series is that they are opposites to one another. Realm Quest truly is the yang to Warped Galaxies' ying, and it embraces a few very different tropes and storytelling elements to craft its world. None of this is to say it is inherently bad. If anything, the differing direction helps it to better establish itself as a sperate story worth reading on its own. However, some of this will depend heavily upon a reader's preferences, and how it impacts The difficulty in judging both Warhammer Adventures series is that they are opposites to one another. Realm Quest truly is the yang to Warped Galaxies' ying, and it embraces a few very different tropes and storytelling elements to craft its world. None of this is to say it is inherently bad. If anything, the differing direction helps it to better establish itself as a sperate story worth reading on its own. However, some of this will depend heavily upon a reader's preferences, and how it impacts an introduction into this new world. Each series has a clear target audience, each has been written with a clear understanding of the setting and it is set to establish the tone, style and dynamic within the series. It's simply that whereas one focuses more upon an episodic format, Realm Quest is following a series based storyline. As such, this review is going to comment as much on the positives and negatives of this as it is the story and direction itself. Set in the modern timeline, City of Lifestone follows the story of Kiri, a slave to the Darkoath Barbarians. With the Mortal Realms now in a state of constant warfare against Sigmar's invading legions, the worshippers of the Ruinous powers demand ever more from their slaves. Kiri dearly wishes to flee from her life, but when she is given the opportunity to do so at last, she finds that her fate is far more complex than she ever could have imagined. A great darkness is coming to the Mortal Realms, and she is but one of a few who might stand against it. The single most surprising thing about City of Lifestone is how it rarely pulls its punches. While few comparisons will be drawn from here on with Warped Galaxies, the flaw in the introduction to that series stemmed from how it did try to avoid grimmer everyday aspects of the world in key areas. With this story, much of what is outlined would be completely at home in a James Swallow or Guy Haley book. Kiri's life is stressful, the barbarians are constantly demanding more from her slaves, and it is an extremely grim existence. While it might not go into the same descriptions as more mature books - or feature the same level of copious body horror - it is displaying the nature of the Mortal Realms to a tee. The story also fits into a specific, and very familiar, style which fits in well with most fantasy readers. It's not quite low fantasy, but there is certainly a Robert E. Howard-esque quality to how life is depicted and events unfold. It leaves you asking as many questions as answering them, but it does more than enough to establish the story and keep you invested very early on. This helps as it follows up events with several chases in quick succession, with little truly told to Kiri about the nature of life or even the mysterious advice her mother offers on her deathbed. Yes, Kiri's mother dies in the opening chapter. I told you this was grim. While the tumultuous quality of Kiri's introduction could have easily put the tale on hold it works for one specific reason: We only know as much as she does. While there are a few bits and pieces which are dropped and the reader is expected to understand, much of it unfolds very naturally. She is an audience surrogate character in this regard, but rather than just using her as an excuse to explain things away, Huddleston utilises it to help better establish the atmosphere and direction of the work. It's akin to how Brothers of the Snake featured a woman unaware of the wider universe, or even the Adeptus Astartes, to establish the tone of the book along with introducing the reader to the Iron Snakes. Furthermore, while sparsely described, there is an undeniably engaging and very interesting quality to Lifestone which makes you want to know more. One major factor within the book stems from how the city itself seems to almost be alive, warping the perceptions of travelers and altering the very streets upon which they stand. Even without this quality, however, it is also in a clear state of decay. Many areas within its limits are a shadow of what they once were, and Huddleston establishes a faded, almost vestigial, quality by simply having Kiri walk its streets. The issue is only made far more evident as events play out, introducing both the supporting cast and main villains into the story. The actual narrative itself is concisely explained, and fully detailed, but you might not realise it at first. Part of this does play toward prophecy, but the story is structured in a way in which offsets the usual problems involving this. Some of the big ones relate more to how it re-orders a number of events and reworks a few ideas to mix things up. While a few typical elements still crop up, this method does at least keep you invested to see where it is going and what else can be utilised in its favour. Finally, there is Billy Piper as the narrator. While her performance has its flaws, she definitely has more hits than misses here. She's one of a few who can evoke the Skaven with the mixture of horror and humour they truly need, and balances the varied tones and qualities of younger characters alongside older ones. Her only shortcoming here is her voice as a narrator, which works in the bleaker moments of the tale, but her tone seems to be off in others. So, that's the good, now let's move onto the bad. The most obvious issue within Realm Quest stems more from how the story is structured and staggered than anything else. You are introduced to Kiri first and foremost, stay with her for most of the story and follow her perspective throughout the whole thing. On the one hand, this helps the tale in terms of just who to follow and the aforementioned advantages of exploring the world. On the other, it means that the tale is wholly tied to her. Characters are defined more by their association with her than anything else, and she takes up a lot of the spotlight which should be more evenly distributed. It's akin to the main failing of Star Trek: Discovery in this regard, where one hijacks what seems as if it should be a multi-person show. The fact that so much of the story is focused upon Kiri also means that there is much less proverbial screen time for anyone else. You only start to learn about the other core characters at all past the story's halfway point, and even then it is a rushed introduction. Yes, they show up here and then before that point and have plenty of moments to interact in front of the reader. However, because these moments are action set pieces or chases, there is little time to fully offer them a chance to present themselves to the reader. A shifting perspective might have helped substantially to offset this but the story lacks that. As a result, the only characters who come across with any substance are Kiri and her two "predecessors", one of who looks as if he might quickly depart from the series. Well, that and the Skaven, but they always tend to steal the show. The sheer volume of characters present within the tale only serves to exaggerate the above problem, however. In a short story such as this, three main characters and a villain would have been fine. This expands that roster to almost twice its size and, without a definitive introduction or time spent to fully introduce them, it can be difficult to keep track of who is who during the third act. Matters are only made more problematic thanks to how City of Lifestone tries to use a lot of tried and tested ideas to hook the reader. The main characters are linked by prophecy, gathered by an older member of the last generation of such individuals, and need to make up for their failure. Each represents a key aspect of the Mortal Realms, and you are likely already thinking of one Saturday morning cartoon or another. This isn't inherently bad if it has something to further bolster it, but this introduction lacks so much of what makes Age of Sigmar so interesting. Much of it is spent avoiding the details which seemed so fascinating, and irritatingly it keeps offering hints at what could follow and might scratch that particular itch. A further problem lies in how the action is handled here, specifically when it comes to outright fights. These are supposed to be largely untrained children, but after a point, the story seems to forget that particular detail. 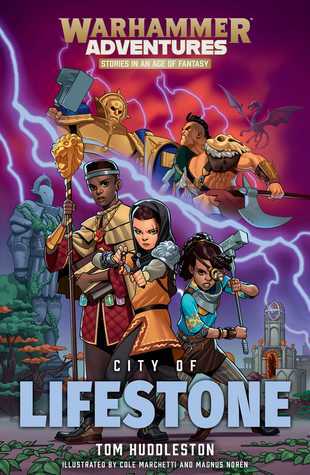 City of Lifestone handles the balance of their skill and inexperience very well for most of the tale, only for them to enter a large-scale skirmish and emerge on top at the last minute, which destroys this sense. Some of it can be excused one way or another, but it feels like a point which should have been saved for a moment much later on in the series when they have fully gelled as a group. Finally, and most pressingly, City of Lifestone doesn't have a definitive ending. It ends on a "To Be Continued..." moment which works, but it leaves more than a few dangling threads which need to be resolved. In a larger book this can certainly work, but in a short tale such as this, it can feel unfulfilling at the end of the day. Combined with how the story is presented and the character elements play second fiddle to introducing Kiri, and it seems as if it was written with an ongoing series in mind, not as an individual tale. For some people this will make it engaging, but for others it can be quite offputting. This is very much a "your mileage may vary" review, as some of the storytelling devices utilised here might appeal to some people more than others. However, in my personal opinion, it caused a few problems which should have otherwise been avoided so early on in the series. One or two fewer characters, more time spent on interaction, and another viewpoint character would have resolved many issues. As it stands, it's a story which looks as if it might be worth looking into further, but how good it will be shall ultimately be decided by how the second story follows up on this one. Three and a half, because this is the first installment of what would be a much longer book. I've read some of the normal Age of Sigmar, and I wish I'd had this to read first because it explains the world very easily. I enjoyed reading it, but again, the story isn't complete. After escaping from a life of slavery, 14 year-old Kiri sets off alone in search of the city of her birth – Lifestone – where she hopes to find a new start. Things don’t quite work out how she hoped, and she’s soon being hunted by skaven and begrudgingly caught up with a strange group of children and their mentor, who tells her of a mysterious purpose for which she’s been chosen. We’re introduced straight away to concepts like Sigmar and the different Realms, and as the story progresses it gradua After escaping from a life of slavery, 14 year-old Kiri sets off alone in search of the city of her birth – Lifestone – where she hopes to find a new start. Things don’t quite work out how she hoped, and she’s soon being hunted by skaven and begrudgingly caught up with a strange group of children and their mentor, who tells her of a mysterious purpose for which she’s been chosen. We’re introduced straight away to concepts like Sigmar and the different Realms, and as the story progresses it gradually builds up a picture – or at least the beginning of one – of the Age of Sigmar setting. It’s told in a way that suits a younger reader, so monsters can be fought and obstacles overcome, and while some elements are a little simplified it’s still recognisably the Mortal Realms. It’s good to see some tough, capable female characters in the shape of Kiri and a couple of the other children. The plot is pacy, action-packed and exciting, and it’s all written in a way that’s easy to read and keeps you wanting more. It’s simple without being simplistic, and works brilliantly for this sort of story (as do Magnus Norén’s excellent illustrations). I really enjoyed this, even though I know very little about Warhammer. It was nicely paced and had some great characters and the story looks interesting. My only complaint was that it would have benefitted from another 50 pages or so. It felt abruptly short, I understand that it's a children's book but but is aimed at the teenage market. I got this mostly because Billie Piper read reads it. I don't care much for fantasy, but this was fun and Billie Piper is a good reader. I'm not familiar with the Warhammer games, but several of my students are big fans of Age of Sigmar and I've been intrigued by the miniatures etc for long enough that I decided to give this a go. Considering the Black Library's success at creating long-running series of books aimed at adults, it's not surprising that they're trying to dip into the middle grade market of potential wargamers. "Realm Quest" is a fast-paced read and quickly explains a lot of the lore in an understandable fashion with I'm not familiar with the Warhammer games, but several of my students are big fans of Age of Sigmar and I've been intrigued by the miniatures etc for long enough that I decided to give this a go. Considering the Black Library's success at creating long-running series of books aimed at adults, it's not surprising that they're trying to dip into the middle grade market of potential wargamers. "Realm Quest" is a fast-paced read and quickly explains a lot of the lore in an understandable fashion without slowing down the story. Really, this clearly is the set-up for a series, presenting the main characters and overall objective of the plot, complete with a dramatic cliffhanger ending. There's a diverse cast of characters and there's some interesting plot-threads started which remain unresolved by the end of the novel. I think this should be excellent for fans of novels like Beast Quest, who want to read a fast-paced series with brilliant action sequences and a whole world of lore to engage in. Looking forward to seeing what my students make of it! I'm Tom Huddleston, author of adventure stories like FLOODWORLD and THE WAKING WORLD, plus several episodes in the WARHAMMER ADVENTURES and STAR WARS: ADVENTURES IN WILD SPACE series. I also write about film and TV for publications including Time Out, Sight & Sound and The Guardian, and I sing in a noisy folk-rock band called The No Sorrows. I was born in Kendal and raised in North Yorkshire, t I'm Tom Huddleston, author of adventure stories like FLOODWORLD and THE WAKING WORLD, plus several episodes in the WARHAMMER ADVENTURES and STAR WARS: ADVENTURES IN WILD SPACE series. I was born in Kendal and raised in North Yorkshire, though I now live in London. I realise that I almost have the same name as Loki, but rest assured I'm not him: I'm slightly rounder and a lot less famous. However, I have managed to make him admit that it's his family who spell their name wrong, not mine.